Cionn Fhánada on the Fanad Peninsula lies between Lough Swilly and Mulroy Bay on the north coast of County Donegal. The Fanad Head lighthouse sits on the western shore of the Peninsula. It can be accessed on road via the Knockalla Coast Road with its panoramic views across the estuary looking towards the Inishowen Peninsula and the Atlantic Ocean. As the road ascends you are greeted at the top by one of the most splendid views in Ireland. Looking down on Portsalon and Ballymastocker Bay it is no surprise that this beach has been voted 2nd most beautiful beach in the world. A haven for water sport enthusiast, golfers and walkers alike, it offers it all. Fanad Head lighthouse sits on the western shore of the Peninsula and was voted the world's 2nd most beautiful lighthouse after Lindau Lighthouse in Germany by Metal Floss in 2013. The Lighthouse is the second most Northerly lighthouse in the Republic of Ireland and locals say that Fanad Head lighthouse is slightly higher than the Eiffel Tower, however, I think it depends on the wind! From the lighthouse carpark you can stroll along the headland in awe of the high waves and the Wild Atlantic Way's most rugged stretch of coastline. With the backdrop of the lighthouse its an ideal photo opportunity for the holiday album. 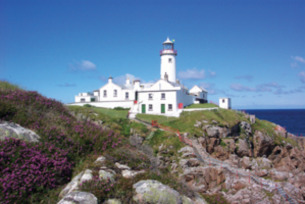 Cionn Fhánada and lighthouse can also be viewed from the sea with Rathmullan Charters who operate sightseeing and historical tours as well as bird, sea watching and relaxing evening cruises along Lough Swilly from their base in Rathmullan.